The ‘Talent Management’ industry is a recent phenomenon – and it does not bear up under scrutiny. There is no evidence to suggest that it helps organisations succeed and it ignores the need to take a deeper, systemic look at the best ways to develop people into consistently high performers. As authors Pfeffer and Sutton declare in their book, Hard Facts, Dangerous Half Truths and Total Nonsense there are ‘…too many business adages…built on flimsy information, miracle cure hype and flawed thinking about best practice…’. Talent Management is one of these. Talent Management is a multi-million dollar industry entrenched in most large corporate HR departments. People’s careers are built around it and those who need it to succeed are very likely to be subject to the very human biases that blind them to evidence that contradicts the fallacies that their industry is built on; that individual ability is largely fixed and invariant; people can be reliably sorted based on their abilities; and the context and the system in which they do it in is less important than individual talent. A Remembering and Causality bias in which we more easily remember the ‘facts’ that support the outcome we have invested in and neglect the ‘facts’ that do not. We are, of course, all susceptible to these biases. It is part of human nature to filter that which we perceive to fit our world view and we are driven to find patterns and simplify the world in order to survive. ‘Talent Management’ is just one of the areas where we have ignored actual evidence in order to justify our actions. ‘Talent’ in the workplace is dependent on context, i.e. the support of the surrounding system, self-belief and effort. High performance is more a function of having access to the right information and tools, than it is on a set fixed of attributes that are then treated as predictors of performance. In addition, repeated studies show that abilities improve markedly when people believe they can get smarter. In other words theories of performance and ability become self-fulfilling. Talent it seems is far more malleable than we are led to believe. In Situations Matter, Sam Sommers explains how we unwittingly view the groups with which we associate quite differently to those with which we are unfamiliar. This book is a powerful reminder of how much context influences us in everything we do and it is not surprising that this is reflected in how we recruit into our organisations. Put in behavioural terms, entrenched beliefs will cause perceptual bias regarding talent and performance. Sommers sites two examples relevant to the misguided notion that we can recruit ‘talent’. The first is a University of Chicago and Harvard Study: ‘Are Emily and Greg More Employable than Lakisha and Jamal?’ in which 5,000 resumes were sent out. Using birth records the researchers gave half the resumes white-sounding names and the other half black-sounding names. They set up separate voice mail boxes for their black and white fake applicants and found that it took 50% more black applicant resumes to get a call back. Why? Sommers concludes that with the pressure of successive judgements to be made with little opportunity to scrutinise, our pre-existing (and often sub-conscious) default associations make a big difference. In a similar Princeton Study white participants were asked to interview students (one white, one black) for an academic team contest. The researchers found that they spent 33% time longer with white candidates and were generally more engaged and communicated with greater warmth and confidence. The interviewers were ‘normal’ but their behaviour changed to create a different experience for white and black candidates. In a second study one set of interviewers were trained to replicate the experience of the white interviewees; sitting close, taking more time, being more engaged, and so on. The interviewees assigned to the ‘engaging’ interviewers consistently outperformed. Watching the playbacks Sommers concludes that one would be convinced that that group were just a more qualified, impressive and interpersonally savvy group of people. So much for recruiting for talent. Category based associations make a significant difference. We are not as fair-minded as we think we are. Bob Kierlin, co-founder of Fastenal, a US-based industrial supplies company, sums it up in Keith McFarland’s book The Breakthrough Company. He says; ‘We started by believing in what people could do. Then we figured out how to create an environment where ordinary people could do extraordinary things’. As McFarland says, this is less about ‘getting the right people on the bus’ and much more about ‘creating a bus worth riding on’. Creating an environment that helps ensure people will succeed based on a carefully and precisely defined business model, access to the right resources and an infrastructure that supports their work is what leads people to achieve high levels of performance. In other words great systems are more important than great people. 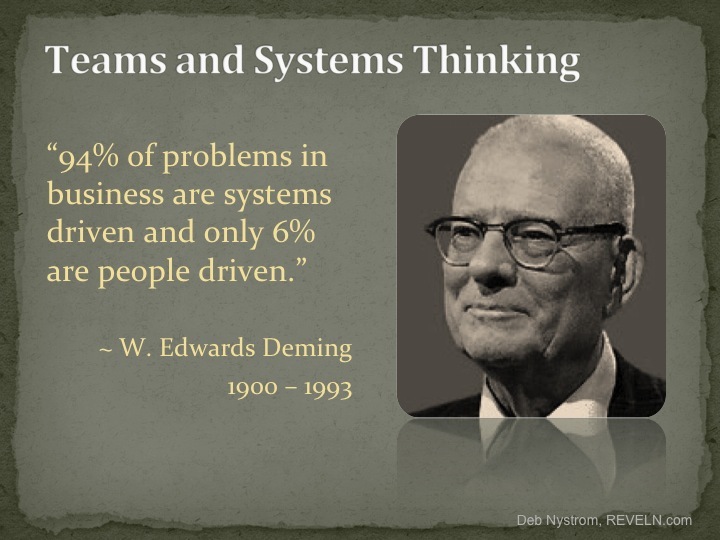 This is precisely what W. Edward Deming was demonstrating more than 50 years ago when he ascertained that if there was a business problem, 9 times out of 10 any improvement required a change to the system not the people. NASA is an unfortunate and regularly-cited example of how poor systems will override good people. Seventeen years after the Challenger tragedy the Columbus Space Shuttle broke up upon entry back to earth killing all seven astronauts. The subsequent Columbia Accident Investigation Board investigation concluded; ‘…cultural traits and organizational practices detrimental to safety were allowed to develop…’, citing ‘…reliance on past success as a substitute for sound engineering practices…’ and ‘…organizational barriers that prevented effective communication of critical safety information…’. Tragically even though the people were different the system was not, producing a similar outcome to that seen seventeen years earlier. Equally compelling is Boris Groysberg’s study of ‘star’ Wall Street investment analysts. In his book The Myth of Talent and the Portability of Performance he traces the performance of thousands of star analysts who change firms. His research showed that they suffered an immediate and lasting decline in performance and that their earlier excellence appears to have depended heavily on their former firms’ resources, organizational culture, networks, and colleagues. So why do so many companies put so much emphasis on ‘recruiting talent’ and so little on building and sustaining great systems to drive systemic high performance? Is it partially due to our glorification of rugged individualism and reluctance to credit a systemic approach when things go right? Is this another blindness that pervades the ‘talent mindset’; a tendency to over-attribute success and failure to individuals? How do the Really Good Businesses ‘Manage Talent’? It seems that the truly great businesses believe everyone is capable of the highest performance and focus on developing systems that makes it possible to turn that belief into reality. They understand that hiring people with the right attributes is difficult not least because the right attributes today may not be what is needed tomorrow. McFarland’s research in The Breakthrough Company shows that the consistently high performing businesses ‘hire attitude and build aptitude’. A large part of the ‘talent’ equation has nothing to do with the way the ‘talent management industry’ says it works. The old fashioned and unfounded virtues of hiring people of character and spending time and effort developing a supporting system that allows those people to develop into consistent high performers is what we should be focusing on. The sooner the myth of talent management is disassembled and organisations focus on what really makes a difference, the better.